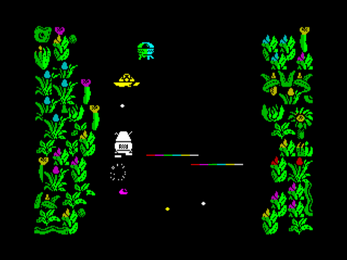 Quadron is an original arcade style game for the 48K ZX Spectrum created in the mould of the 1980s Williams classics. Set in the Quadron complex, you are charged with the task of defending the crystals mined by the relentless onset of marauding aliens. Featuring fast arcade style gameplay, multiple weapons, enemies, collectables, powerups, and a pointer based status screen and scanner, the game calls for both fast reactions and a surprising dose of strategy! Keyboard, Sinclair and Kempston joystick compatible. The player controls a droid set in the Quadron complex tasked with collecting and protecting valuable crystals from the relentless onset of marauding aliens. The complex consists of 28 screens forming a square, four of which are hidden behind force-fields that cannot initially be accessed by the player’s droid. At the start of the game eight crystals are firmly buried within the four rocks found at the corners of the complex. 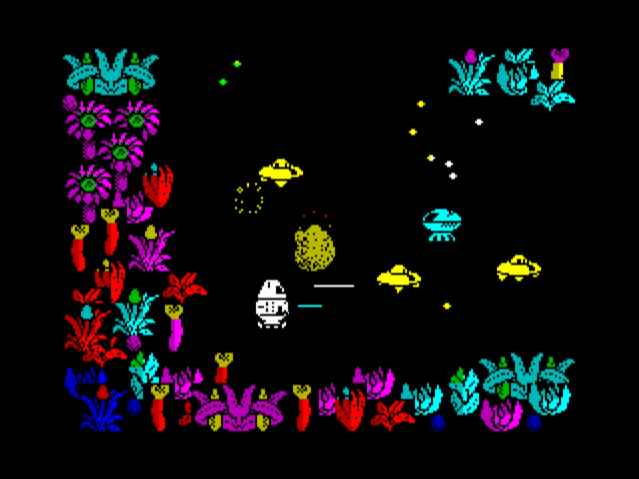 Only the Probe (yellow) or Super Probe (green) aliens can mine them to release them. Fetchers (cyan) circle the complex looking for such free crystals (white). If they find one, they’ll take it to one of the four conversion screens set at midpoints on each side of the map, blast open the force-field and use the converter inside destroying the crystal in the process and becoming much meaner Meta-Fetchers (cyan). These Meta-Fetchers will then relentlessly chase the player’s droid and are difficult to destroy, but can easily be dispatched with crystals held and launched by the player (keys V or B). Use the SPACE key to call up the Status Screen to monitor the location and condition of the crystals and aliens in the base via the scanner at the top of the screen. Fetchers carrying crystals are highlighted magenta to alert the player. Also shown on the Status Screen are your score, lives, crystals held, items collected and their four associated energy types. Use the pointer to activate items that have enough energy to operate (represented by the energy bars). Play continues until all aliens have ‘warped in’ and been destroyed for that wave. Should the player take too long, Warpers (yellow) will appear, encouraging the player to finish the wave as soon as possible. Other aliens types are introduced in later waves, such as Modules, Seekers and Lurers. For more details on them and more please see the Basic or Detailed Instructions PDF files included with the download. 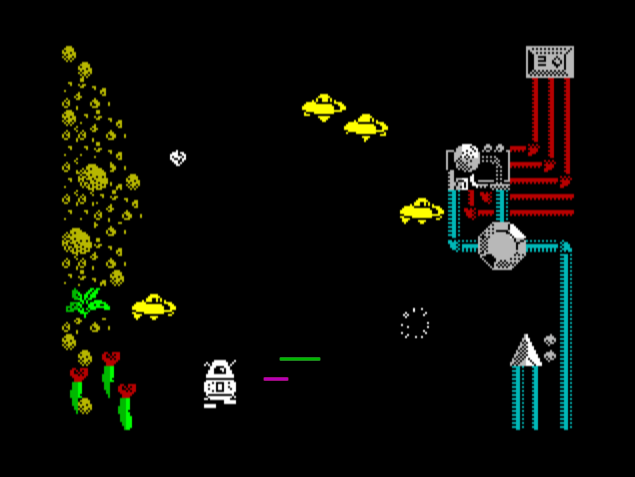 You'll need a ZX Spectrum emulator emulating a 48K Spectrum to play Quadron. Click the Quadron.tap tape file or Quadron.sna snapshot file to download the game then start your favorite ZX Spectrum emulator in 48K mode and open the file to play. 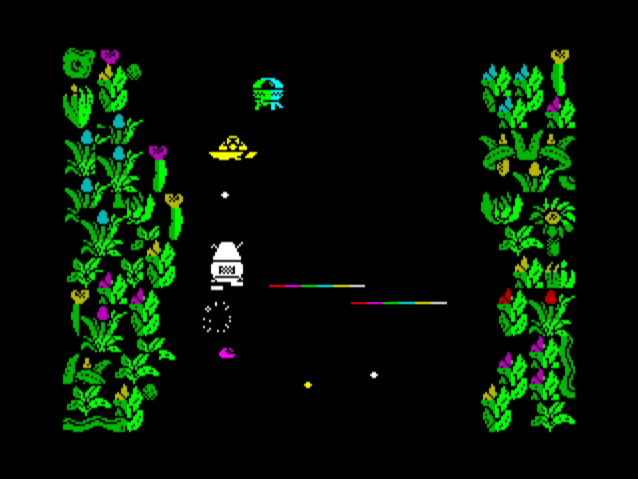 The game has been tested on Spectrum Anywhere, ASCD, ZX Spin for PC, Marvin for Android and other Spectrum emulators. 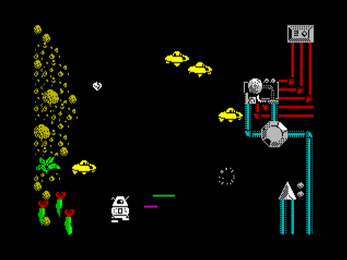 The game was written in assembler on the Spectrum over the course of two years and completed in early 1988. Sadly, the publisher (now defunct) pulled out towards the end of development and the game remained unreleased along with its plans for an Amstrad CPC conversion. Now on its 30th anniversary I'm making it available for anyone interested. While I don't have access to the original source code, I do have many of my original notes and have been working with the disassembly to prepare the game for release with a few tweaks and bug fixes. As part of the downloads I've also made available scans of the basic and detailed instruction printouts from 1987, complete with the original spelling / grammatical errors! Interesting game. However, I agree with the other comment here – a tape file is badly needed. ESPECIALLY given that this is a paid-for game, it really MUST be supplied in a better form than just a snapshot. That's so half-hearted. (And .SNA isn't even the best snapshot format: it's wasteful. .Z80 format does the same thing but uses a smaller file size and also supports 128K snaps.) This game NEEDS to be supplied as a .TAP file, and ideally as a .TZX file as well. The .TAP file format is best – especially for regular loaders (i.e. non-turbo loaders) – because it works with EVERYTHING, including loading into real machines. If you want to use a fancy loader, supply a .TZX file as well. (But please note that the new ZX Spectrum Next currently can't handle .TZX files, which is one reason why a .TAP is so important: it's absolutely the best option on the Next.) If you need to have a loading screen designed, I recommend approaching Andy Green, who does superb work (search for Andy Green Pixel Art on Facebook). Meanwhile the loading screen was recently completed based on what I had left of the original screen art from 1988, and is included in the latest .sna update that just went up! Excellent. I love 'perfect' snapshots like these, which show the loading screen until you press a key. So, that's great. All we really need now is a tape file. Many thanks for all your efforts! I will certainly buy this if you could make a *.tzx version available (or even *.tap). - please see the reply above! Thanks very much for the kind words. I'll email you at Cronosoft! ..
Great work! Please make more games for the ZX! Glad you liked it! Thanks for the encouragement! The game is fast and action packed, with a real sense of running for your life when those souped-up crystal-enhanced meanies come after you. Great to see this out there at last! "a real sense of running for your life" - early design notes from 1986 reveal that this was just the feeling I was aiming for, so I'm happy to hear it had the desired effect! Thanks for the feedback.